UPDATE May 5, 4:26 a.m.— Police yesterday stated in a charging announcement that the offender is 15-years-old, not 16. Our original report follows. A man was carjacked at gunpoint near Wrigley Field on Monday night while the Cubs were playing the Philadelphia Phillies inside the Friendly Confines. One offender sped off with the victim's car, crashed on a Lakeview side street, then engaged cops in a foot chase that ended with him being caught at gunpoint outside of the Briar Street Theater. Two other offenders are being sought. Police at the scene of the crash said that a 16-year-old juvenile is in custody. The 56-year-old victim told cops that he was in traffic near Clark and Sheffield when another car pulled in front of him and two teenage boys got out, one of them brandishing a handgun. The armed teen forced the man from his car around 10:15 p.m. and the second teen searched the victim for valuables before the gunman got into the driver's seat and sped off. The second offender returned to the robbers' car, which also jetted east on the 800 block of West Newport. 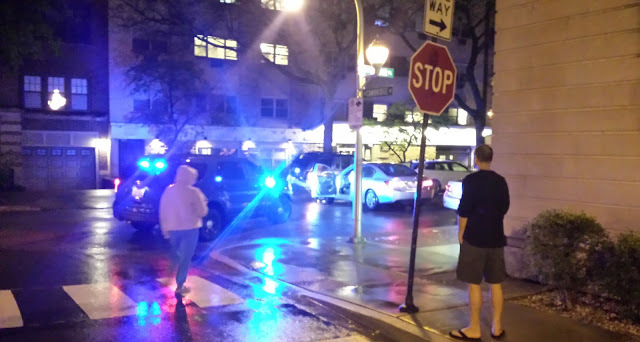 After speeding south on Boystown’s Halsted Strip, cops caught sight of the offender as he raced east on Belmont toward Lake Shore Drive, according to witnesses and police. When officers tried to pull the car over, the driver turned south on the rain-slicked 3100 block of North Cambridge Avenue and lost control of the vehicle at the end of the narrow one-block-long street. The car crashed into two parked and unoccupied vehicles, its airbags deployed, and the offender jumped out and ran with a solo cop following on foot. The teen was taken into custody at gunpoint minutes later outside of the Briar Street Theater, longtime home of the Blue Man Group. Nearly an hour after the crash, officers could still be seen searching several Lakeview blocks for the offender’s firearm. After midnight, a police evidence technician was seen removing the victim's cellphone from his wrecked car's floorboard. The phone, which was taken from him by the robbers, had been left behind. Police are still looking for the two offenders who got away in the crew's original vehicle. Monday's victim was the second man to lose his car to armed carjackers in the Wrigleyville and Boystown area since Sunday evening. Around 9 p.m. on Sunday, a man told police that three teens took his car after threatening him with a black revolver in the 500 block of West Cornelia. The offenders got away. The first suspect wore a black hoodie and had a short buzz cut. He stands about 5’8” tall. The second suspect wore a dark top with red writing. He is a little taller than the first man. No further information was available about the third suspect. 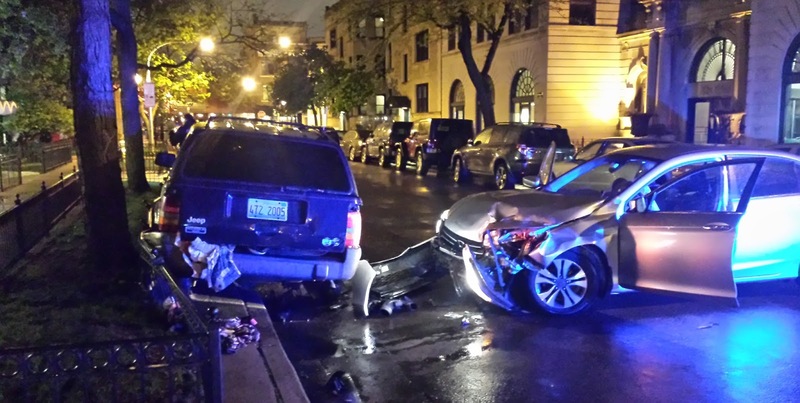 Last Friday, a man foiled three teenagers' attempt to steal his idling car in the 3500 block of North Clark, a half-block from Wrigley Field. That incident was one of seven similar auto thefts and carjackings within 12 hours on the North and Near West Sides, according to a police bulletin. The alert described those offenders as black males who were last seen wearing all dark clothing or a black and gray hooded sweatshirt.